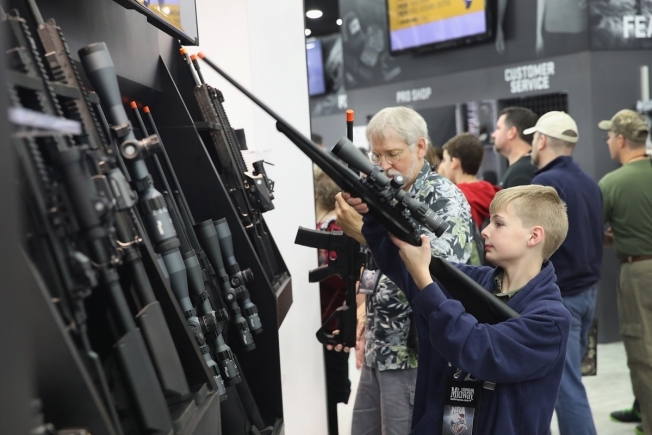 In this May 21, 2016, file photo, gun enthusiasts look over elector Optics scopes at the NRA Annual Meetings & Exhibits in Louisville, Kentucky. The National Rifle Association has given more than $7 million in grants to hundreds of U.S. schools in recent years, according to an Associated Press analysis, but few have shown any indication that they'll follow the lead of businesses that are cutting ties with the group following last month's massacre at a Florida high school. Florida's Broward County school district is believed to be the first to stop accepting NRA money after a gunman killed 17 people at one of its schools Feb. 14. 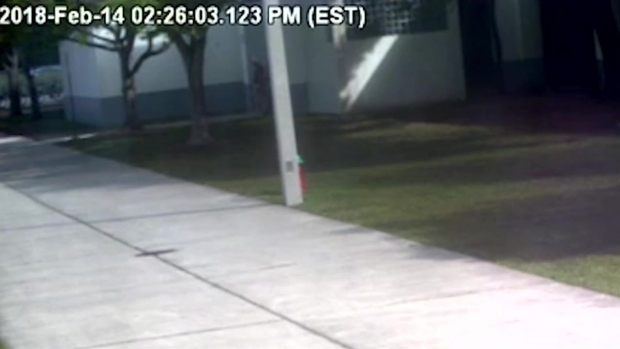 The teen charged in the shooting had been on a school rifle team that received NRA funding. Denver Public Schools followed Thursday, saying it will turn down several NRA grants that were to be awarded this year. But officials in many other districts say they have no plans to back away. The AP analysis of the NRA Foundation's public tax records finds that about 500 schools received more than $7.3 million from 2010 through 2016, mostly through competitive grants meant to promote shooting sports. The grants have gone to a wide array of school programs, including the Junior Reserve Officer Training Corps, rifle teams, hunting safety courses and agriculture clubs. "Whatever I think of the NRA, they're providing legitimate educational services," said Billy Townsend, a school board member in Florida's Polk County district, whose JROTC programs received $33,000, primarily to buy air rifles. "If the NRA wanted to provide air rifles for our ROTC folks in the future, I wouldn't have a problem with that." Broward announced Tuesday that it would no longer accept NRA grants, following more than a dozen major businesses that have split with the group in recent weeks. Companies including Delta Air Lines, MetLife insurance and the Hertz car agency have said they will no longer offer discounts to NRA members. Annual reports from the pro-gun group say its grant program was started in 1992 and raises money through local Friends of NRA chapters. It says half the proceeds from local fundraisers go to local grants and half goes to the national organization. Tax records show roughly $19 million in grants going to the group's Virginia headquarters in 2015 and in 2016. Besides schools, other typical recipients include 4-H groups, which have received $12.2 million since 2010, Boy Scout troops and councils, which received $4 million, and private gun clubs. Overall, about half the grants go to programs directed at youths. Nearly half of the 773 grants awarded to schools have gone to JROTC programs, which put students through a basic military curriculum and offer an array of small competitive clubs, like the rifle team at Broward's Marjory Stoneman Douglas High School. But JROTC leaders say few students ultimately enlist in the military, and the primary goal is to teach students skills like discipline and leadership. "The safety that we're teaching, the good citizenship that we're teaching here, those are the things you don't hear about," said Gunnery Sgt. Jim Flores, a JROTC instructor at Cibola High School in Albuquerque, New Mexico. "The majority of people walk out of here awesome young men and women, respectful of authority, things of that nature. Not so much little tin soldiers." In some parts of the country, shooting clubs draw the same sort of following as any school sport. Bill Nolte, superintendent of the Haywood County district in North Carolina, says he still shows up at school sportsman's club tourneys even though his son graduated. Starting in sixth grade, students can join the clubs to compete in shooting events, archery and orienteering. For many families, Nolte said, it's just like any other weekend sports event. "You take your lawn chair and your coffee in a thermos, and do much like you would do if you were going to a youth soccer or travel basketball or baseball event," Nolte said, adding that NRA grants have helped buy firearms and ammunition and cover other costs that otherwise would fall to the parents. "We are constantly seeking revenue for sportsman's club just like we do for cheerleading and track." Districts that tallied the largest sums of NRA money typically used it for JROTC programs, including $126,000 given to Albuquerque schools, $126,000 to Broward County and $125,000 to Anchorage, Alaska. The most awarded to a single district was $230,000, given to Roseville schools near Sacramento, California, which say much of the funding went toward ammunition and gear for trap-shooting teams. "After we get through this spring, we will probably take some time to assess how to move forward," he said. School board members in some districts said they didn't know about the grants. Donna Corbett, a Democrat on the school board in southern Indiana's New Albany-Floyd County School Corporation, said she never heard about $65,000 that went to a JROTC program at one of the high schools. Corbett said she plans to raise the issue with her board but feels conflicted about it. "I am not a big NRA fan, but I also realize that ROTC is a good program," she said. "I'm not sure I would be willing to pull it to the detriment of the kids and their programs." In some ways, the issue reflects the nation's deep political divide over guns. Nearly three-quarters of the schools that received grants are in counties that voted for President Donald Trump in the 2016 election, while a quarter are in counties that voted for Democrat Hillary Clinton, according to the AP analysis. Most are in medium-sized counties or rural areas, with few near major cities. In Massachusetts, for example, known for its strict gun laws, no schools have received NRA grants since 2010, tax records show. Terry Ryan, a school board member in the Westford district northwest of Boston, says a local teacher considered applying for a grant in 2014, but the district ultimately didn't pursue it. "We were not interested in any way, shape or form endorsing the NRA or its philosophy," Ryan said in an interview. By contrast, parent Jana Cox in Louisiana's Caddo Parish says few in the area would have a problem with the $24,000 in NRA grants that have gone to school JROTC programs. "Everybody here has guns," Cox said. "This is north Louisiana. You've got a lot of hunters and you've got a lot of guns." Lt. Colonel Ralph Ingles, head of the JROTC program at Albuquerque schools, says the Florida shooting has sparked a conversation about NRA grants, but he doesn't anticipate cutting ties anytime soon. "I don't see anybody really backing down," he said. "I think it's just ingrained that we're going to continue to move forward in a positive direction." 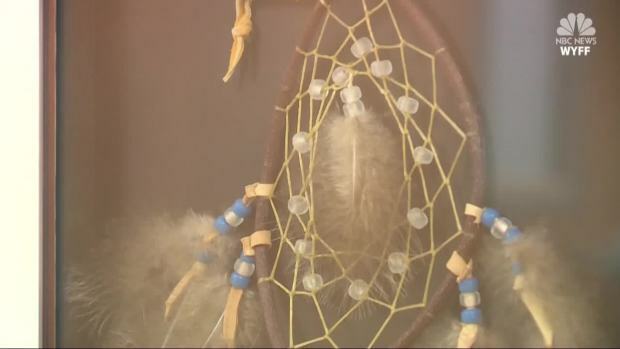 A dreamcatcher handed from school to school suffering after a shooting is making its way from Townville, South Carolina, to Parkland, Florida. It was first left at Columbine High after a massacre at the school in 1999.